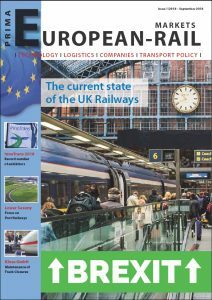 The PRIMA European-Rail Markets is the English version of the Privatbahn Magazin and aims to address the international railway industry. Apart from the presentation of innovative companies from the fields of industry, logistics and transportation – the Privatbahn Magazin extensively reports on the developments of the carrier ‘railway’. Regular interviews with decision makers, news on the latest trends in the fields of research, technology, economy, transportation policies and logistics as well as excurses concerning the history of railway transportation are all aimed towards experienced readers as well as interested laities.